PRICE: Free with $36.00 purchase while supplies last. At the end of the year, Wolfpak Decals provides a freebie for customers. This is generally a small sheet with some rather interesting subjects and this year's offering is no different. 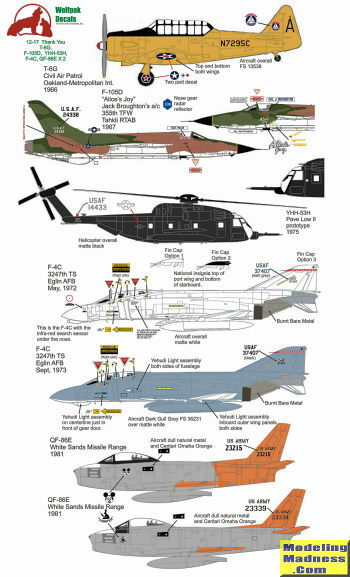 There are seven options covering five aircraft types from five units. First up is a T-6G from the Civil Air Patrol based at Oakland in 1966. Overall yellow with a black anti-glare panel and canopy area. Note that this one has gear doors and a prop spinner. Next is an F-105D named 'Alice's Joy' with the 355 TFW based at Tahkli in 1967. The all black prototype YHH-53H 'Pave Low' aircraft is from 1975. Two schemes and options on the same plane are next. This is the F-4D attached to the 3247th TS based at Eglin AFB. These planes had a tail band of red diamonds. The initial option is all matte white plane, while the second got an upper surfaces of dark gull grey along with the Yahudi Lights on the lower wings and fuselage intakes. This also had the IR probe removed from the underside of the nose for another light assembly. It looks fairly easy to replicate these lights so would be an interesting mod for the Phantom Phan. Finally, a pair of QF-86E drones based at White Sands in 1981. These are ex-RCAF Sabre 5s purchased and modified specifically for the Army as they needed an inexpensive alternative to the USAF's QF-102s. Both are unpainted metal with varying areas of 'Centari Omaha' Orange on the wing tips and tail section. Note that both planes carry artwork under the canopy. There are good kits for all of these options so finding one that works for you will not be an issue. Some of these will require upgrade sets and that information is provided. The decals are superbly printed by Fantasy Printshop.